Trump's praise for Greg Gianforte, a Republican member of the U.S. House of Representatives who pleaded guilty to an assault charge for the incident involving the reporter, coincides with an international outcry over the disappearance of Saudi journalist Jamal Khashoggi. "Any guy that can do a body-slam, he's my guy," Trump told a political rally in Missoula, Montana on Thursday night, referring to Gianforte. 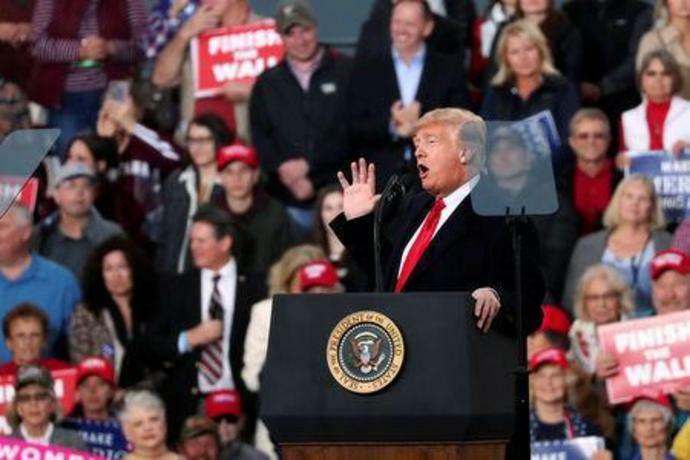 Trump has been holding frequent rallies before the Nov. 6 U.S. congressional elections in which Trump's fellow Republicans seek to retain control of the House and Senate. Gianforte body-slammed Ben Jacobs, a correspondent for Britain's Guardian newspaper, in May 2017, the day before a special election to fill Montana's only House seat. Gianforte, who is running for re-election, pleaded guilty. "That was a different league, a different world ... Greg is a tremendous person. He's a tough cookie," Trump told reporters. Trump drew rebukes from several lawmakers including U.S. Senators Jeff Flake, a Republican, and Patrick Leahy, a Democrat, as well as Gianforte's Democratic opponent Kathleen Williams, and from the spokeswoman for the United Kingdom's prime minister. "In dictatorships, they don't have freedom of speech. They do attack reporters. They do body-slam reporters. We should not be encouraging that in the United States. We should be the beacon of freedom," Leahy told CNN, and called Trump's comments "terrible" and "irresponsible." Theresa May's spokeswoman told reporters on Friday: "He obviously made comments at a political rally, and those are for him. But more generally we would always say that any violence or intimidation against a journalist is completely unacceptable." Trump has frequently criticized journalists, calling the news media the "enemy of the American people" and deriding some news organizations as "fake news." Olivier Knox, president of the White House Correspondents' Association, accused Trump of "cheerleading for a violent act targeting a free and independent news media" in a statement. Rep. Steve Scalise, a House Republican leader and a victim of a shooting last year, said in a tweet: "President Trump was clearly ribbing Congressman Gianforte for last year's incident ... He was not encouraging his supporters to engage in attacks."